The combat in The Division 2 feels great and is one of the main parts of the game that keeps me coming back. Yet, one of my favorite things in The Division 2, quarantine zones, aren’t about combat or even shooting really. Instead, these spaces are focused on exploration and narrative. I really wish there were more of them too. The quarantine zones are wonderful small puzzle boxes, filled with tiny stories of how people lived and died in this world. In the game’s fiction, these zones are areas of the map that contain deadly chemicals or the dangerous dollar flu, the disease behind the massive epidemics seen in the game. To protect people, these buildings have been quarantined off. They are covered in yellow hazmat tarps, chainlink fences, and clear plastic doors. These zones feel quiet and dangerous in a way most other parts of the map don’t. The first time I walked up towards one, I felt a tinge of nervousness entering the building. Warning signs, hazmat equipment, and UV lights litter the outside and inside of these areas. Your character even dons a gas mask when entering, to avoid inhaling any of the deadly particles or chemicals still contained inside. Once inside, the main goal of each quarantine zone is to explore them entirely, collecting all the audio and text recordings sprinkled in the area. Each of these zones tells different stories of different groups of people. One area contained folks who were sick and needed a place to stay in a world where they are seen as bringers of death. Another area detailed the tragic story of a massacre of survivors. One area even told the sad story of a young child dying of the disease or an old woman talking to her dead family as she drifts towards her own death. These aren’t happy stories, but they do add more to the world, making the wasteland of D.C. feel more human and believable. To find all of these bits of storytelling, players will need to solve puzzles and navigate the buildings’ hallways, sewers, tunnels, and ladders. None of the zones are particularly challenging to work out, but they provide just enough difficulty that solving some of the puzzles still feels satisfying. Many of the puzzles involve finding fuse boxes and shooting them or flipping switches to unlock doors somewhere else in the zone. While these puzzles won’t stump most folks, they do provide a nice change of pace from the usual shooting and looting. Some of the areas these zones are located in are also fascinating to explore. One of my favorites is a museum housing models of ancient creatures, like mammoths. That particular zone even contained some other surprises that I won’t spoil here. Each of these zones feels distinct from one and other, with each filled with unique details and lore. Sadly, some of these quarantine zones, or Q ZONES as nobody says, don’t always work right. I got stuck in an elevator during one zone, forcing me to restart the zone after fast traveling away and back to the area. Another zone is marked as unfinished on my map, even though I’ve found everything in the building. Other players are sharing stories of similar bugs they are running into in these zones. It’s a shame that these places are currently so buggy because when they worked they were some of the most fun I had in The Division 2. In fact, I loved exploring them so much that I was sad to find out there are only five currently in the game. The Division 2 will be receiving updates for potentially years to come, so maybe future updates will add more of these zones to explore. I really hope so. 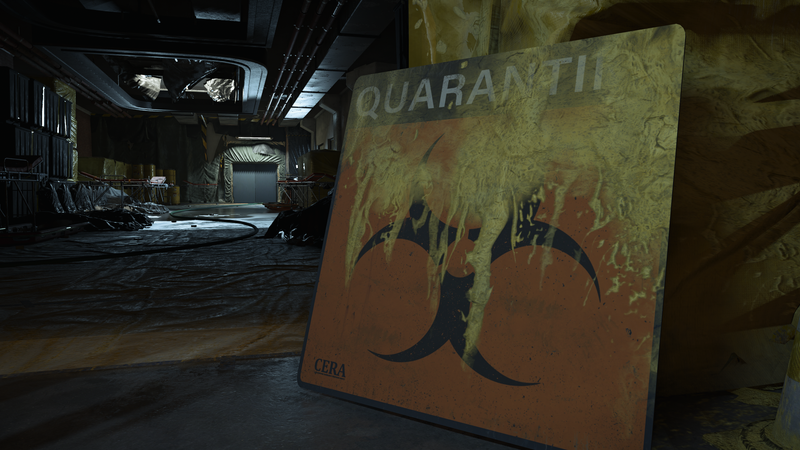 These quarantine zones were a fantastic change of pace and helped flesh out the world more. I just hope future zones are less buggy and a little bigger and more complex.